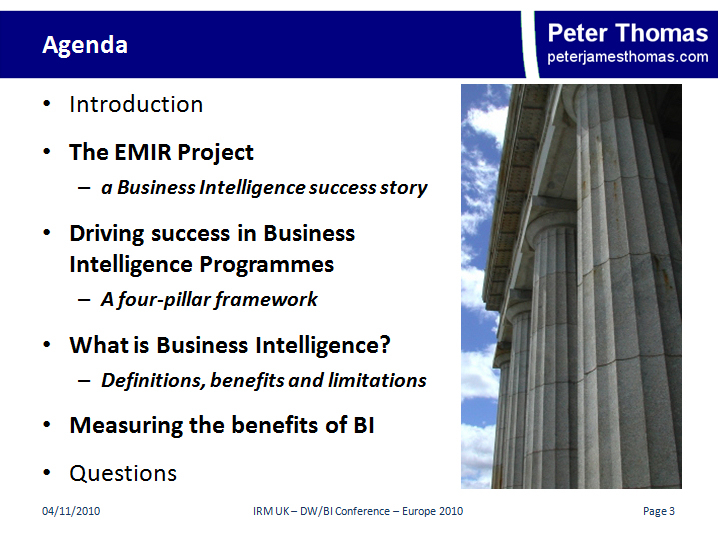 As previously advertised, I presented at the recent IRM(UK) DW/BI seminar in London. As a speaker I was entitled to attend the full three days, but as is typically the case, other work commitments meant that I only went along on the day of my session, 4th November. A mixture of running into business acquaintances, making sure that audio/visual facilities work and last minute run-throughs of my slides all conspired to ensure that I was able to listen to fewer talks that I would have liked. In comparing notes with other speakers, it is generally the same for them. Maybe I should consider attending a seminar as a delegate sometime! Nevertheless, I did get along to some presentations and also managed to finally meet Dylan Jones of dataqualitypro.com (@DataQualityPro) in person after running into each other virtually for years. Unfortunatlely, I also managed to fail to connect with a number of tweeps of my acquaintance including: Loretta Mahon Smith (@silverdata) – who even attended my talk without us bumping into each other – and Scott Davis (@scottatlyzasoft); I guess that is just how it goes with seminars sometimes. At face value these may seem odd bed-fellows. However, Lori Silverman of Partners for Progress managed to intertwine the two effectively. This was despite being handicapped by an attack of laryngitis that meant that her, already somewhat nasal tones, from time to time morphed into a shriek. Sitting as I was directly beside a loudspeaker, I felt some initial discomfort and even considered departing for a less auricularly challenged part of the conference centre. However I was glad that I decided to tough it out because Lori turned out to be a very entertaining, engaging and insightful speaker. I won’t steal her thunder by revealing her main thesis and instead suggest that you try to catch her speaking at some future point, she is well worth listening to in my opinion. I next attended a presentation by leading open source BI company Jaspersoft. This was kicked-off by their CEO Brian Gentile who then introduced a case study about an Irish Government department rolling-out the company’s products. The implementer, was System Dynamics, Ireland’s largest indigenous IT business solutions company*. System Dynamics CEO Tony McGuire and BI Team Lead Emmet Burke both spoke about this recent project, which covered 500+ users. Open source has traditionally had something of a challenge establishing a foothold in the public sector. The assertion made in this session was that the current fiscal challenges faced by the Irish Republic meant that it was becoming an option they were giving greater credence to. I guess, as with many areas of open source applications, it is probably a case of waiting to see whether a trend establishes itself. John Taylor of Information Builders was speaking in the room that would next host my session and so I was able to catch the last 15 minutes of his presentation on Information Management, which seemed to have been well-attended and well-received. My presentation occupied the graveyard slot of 4:30pm and I led by saying that I fully realised that all that stood between delegates and the drinks reception was my talk. Given the lateness of the hour, I had been a little concerned about attendance, but I guess that there were at least 50 or so people present. All of them stuck it out to the bitter end, which was gratifying. There is always the moment of frisson in public speaking when, at the end of the talk, you ask whether are any questions with an image of tumbleweed spinning across the prairie in your mind (something that happened to me on one previous occasion a long time ago). Thankfully the audience asked a number of interesting and insightful questions, which I answered to the best of my ability. Indeed I was locked in discussions with a couple of delegates long after the meeting had officially broken up. In my introduction, I began by issuing my customary caveat about the danger of too blindly following any recipe for success. I then provided some background about my first major achievement in data warehousing and went on to present the general framework for success in BI/DW programmes that I developed as a result of this. In concluding the first part of the speech, I attempted to delineate the main benefits of BI and also touched on some of its limitations. Having laid these hopefully substantial foundations, the meat of the presentation expanded on ideas I briefly touched on in my earlier article Measuring the Benefits of Business Intelligence. This included highlighting some of the reasons why measuring the impact of BI on, say, profitability can be a challenge, but stressing that this was still often an objective that it was possible to achieve. I also spent some time examining in detail different techniques for quantifying the different tangible and intangible impacts of BI (most of which are covered in the above referenced article). My closing thought was that, in situations where it is difficult to precisely assess the monetary impact of BI, the wholehearted endorsement of your business customers can be a the best indirect measurement of the success (or otherwise) of your work. I would recommend that fellow BI professionals pay close attention to this important indicator at all stages of their projects. You can view some of the tweets about IRM(UK) DW/BI here, or here. Disclosure: At the time of writing, System Dynamics is a business partner, but not in the field of business intelligence. Managed to mess up the social bookmarks when I originally published this article – apologies for the inconvenience; I clearly haven’t been blogging enough recently :-o.